In Sun of gOd, cultural pioneer and philosopher Gregory Sams takes a fresh look at our solar benefactor. As Sams sees it cultures throughout the ancient world were right to recognize the Sun as a living, conscious being. The implications of a conscious provider in the sky are startling, though often obvious -- and in harmony with science, logic and common sense. 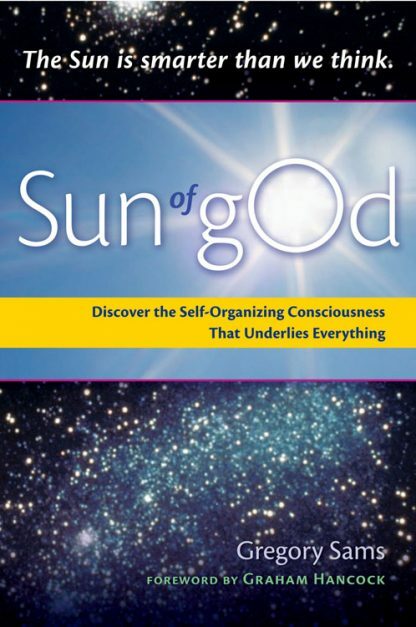 Sun of gOd explores exciting new ground, adding a crucial piece to the jigsaw-puzzle picture we have of the cosmos. In the light of a conscious Sun, Sams looks at our hard-wired tendency for religion, notions of god and divinity, our place in the firmament, star formation, intelligent light, electromagnetism, feedback, chaos theory, free will, the four elements, and the near-universal self-organization of systems from the bottom up. "Could it really be that the universe waited 13.7 billion years -- until we came along --to manifest the phenomenon of consciousness and made ours the only type of vessel able to experience it?" Sams thinks not. Citing David Bohm's discovery that even on the subatomic level of electrons there appears to be intention and choice, Sams goes on to suggest that creative intelligence may be a bottom-up system in which "everything, from a molecule of water to a neuron in our brain to the Sun itself, is a part of the bottom that is subtly steering a greater whole." From this perspective, he smoothly joins the microcosm to the macrocosm, revealing a Universe incorporating both intelligence and design, with no need for an Intelligent Designer.